Last time I outlined the key questions you need to think about when you start to design your monitoring system. It is important of course to keep alive the link between collecting data and telling your impact story. Being able to properly articulate the changes that you are making or contributing towards is essential if you want to have a great relationship with the community of supporters, donors and beneficiaries that you have built up around you. Sure it is important to have good case studies, but those case studies are valuable when they illustrate broader trends and are the human face of the successes that you have achieved. That means having robust data and a robust monitoring system that produces that data. Fortunately a good monitoring system is something that most people can agree on and a framework for what a good monitoring system looks like is available. I’ve shown the PMDPro version below. 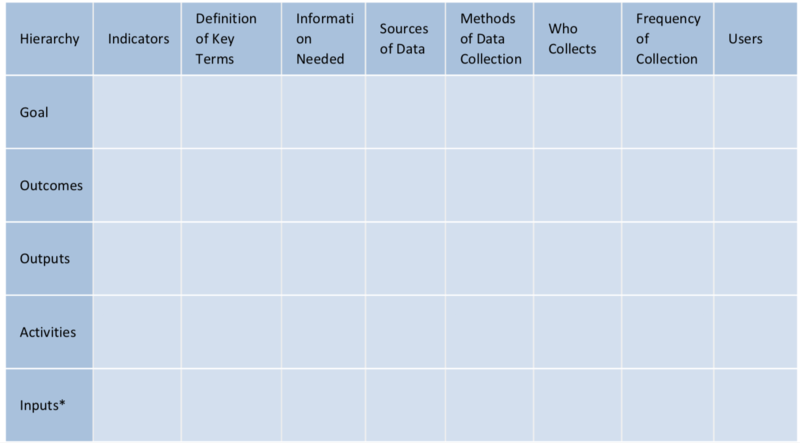 Sometimes the columns are in a different order, but all versions include columns that tell you why you’re collecting what type of data, when, from whom and for whom. Having this clear and implementing such a plan will help you to tell a strong impact story because you will be able to plan in advance what kind of data you need, when you need it by and how you will get that data. Of course getting to this stage assumes that you have already confirmed (in a participatory manner with the beneficiaries that will be affected by this intervention and with the donors funding the intervention) what the goal, outcomes, outputs, activities and inputs are for the programme or project. If you still need to do that, step away from this blog and email me instead for help on getting those right. This gives you time and space to focus on delivering your intervention and celebrating the change that you are contributing towards!